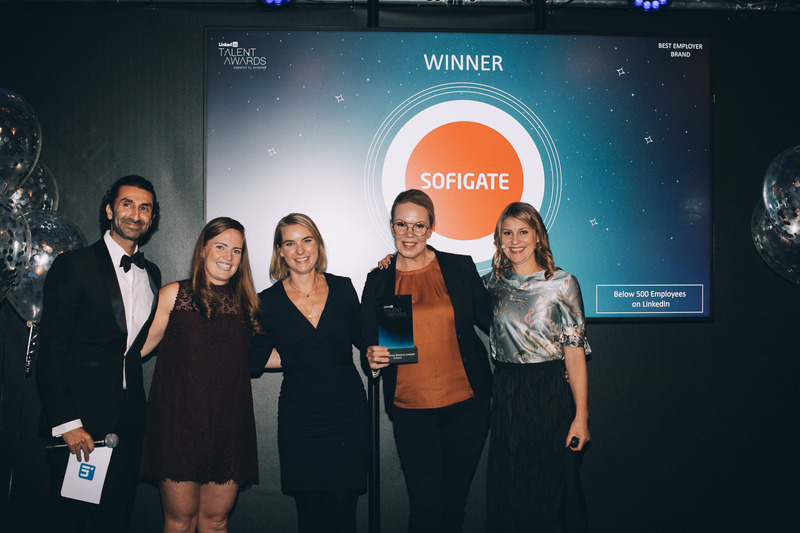 Sofigate is a winner of the LinkedIn Nordics Talent Awards 2018. Last night, in the beautiful city of Stockholm, the business-oriented social media brand hosted its very first Nordic version of the Talent Awards. Sofigate, being nominated in the category of Best Employer Brand below 500 employees, was present in the awards with a Finnish and Swedish representative team. And little did we know that the night would end in a celebration as we were named the winner of our category. The LinkedIn Talent Awards was organized for the first time for Nordic countries this year. LinkedIn analyzes the performance and impact of more than 1000 companies of each of the participating countries from which the winner is chosen. We can never emphasize the importance of our talents enough. Growing and finding more of these irreplaceable stars of our company is a part of our strategy. That is why we already are over 500 employees and aiming to grow even more. Our goal is to have a total of 1000 people by 2020 to support our success. Want to be a part of the winning team? Find our available positions at Sofigate.com/careers.